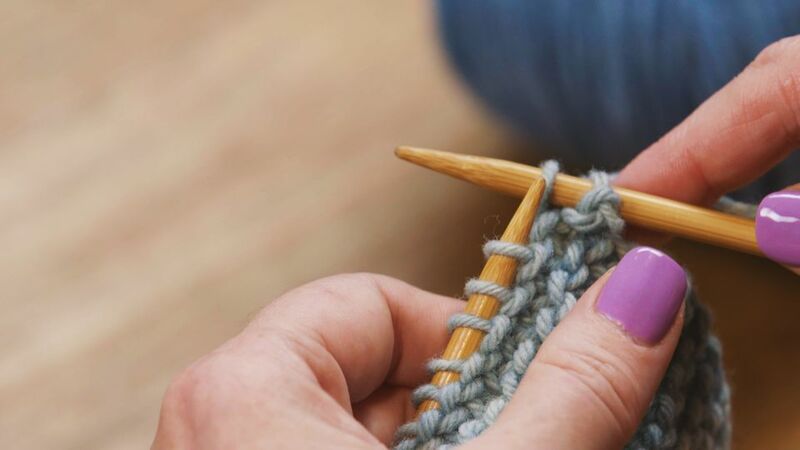 Once you've cast on, knitted, and purled your pattern, and basically finished your project, there's just one more step that has to be completed—getting your project off the needles. This is accomplished by what's known as binding off or casting off. It is a simple and quick method for making a finished edge. When you complete the last row of your pattern you will begin to bind off just as if you were continuing the pattern. If you are using a pattern without a definite end you would start casting off when you have knitted until you have at least enough yarn to make about three times the length of a row. You'll often see patterns that say "bind off in pattern," meaning that you knit the knits and purl the purls just like you were doing in the body of the project. Binding off works the same no matter what stitch you're using. Start by knitting or purling (or whatever pattern stitch you were working in) the first two stitches of the row. Once you have two stitches on the right-hand needle, use the tip of the left-hand needle to pull the first stitch back up and over the second stitch and over the tip of the right-hand needle. This will leave one stitch, actually the second stitch you worked, on the right-hand needle. Knit or purl the next stitch as needed and repeat the process until you are left with no stitches on the left-hand needle and one stitch on the right-hand needle. Slip this last stitch off the needle. Trim your working yarn so that you have a few inches left over to weave into the finished work. Slip this yarn through the loop and pull tight, securing the yarn so the loop won't unravel. You can also just pull the stitch until the tail end pulls through. This does not make a bump and looks a lot nicer in the finished work, but it's up to you. Weave the end of the yarn through several stitches to secure the end, using either a sewing needle or a crochet hook. Alternative: Some knitters like to go until they have two stitches on the left-hand needle, knit those two stitches together, then finish as usual. This makes for a bind off that looks a little more uniform across the top, rather than leaving a loose stitch hanging at the end. Wear or use your new knitted item proudly. Binding off is one of the most common ways to end a project but that's not the only time to use this technique. It's also used to help shape your project. You'll often find this stitch used for things like baby booties when forming the ankle part of the bootie. There are other stitches you can use to finish your projects but binding off is one of the simplest. With this stitch, you'll be able to finish any project and add some shape to others.